In Crete, young cooks and winemakers are fascinated by the island’s ancient flavors. Writer Gisela Williams searches out the best, starting with an Ottoman Era-inspired brunch. Two years ago, when a Hollywood celebrity wanted to take his family and friends to Greece, his team contacted Beyond Spaces, the country’s top villa rental company. Maria Nikolakaki, its founder, organized a ridiculously over-the-top trip in the Cyclades, featuring an elaborate treasure hunt based on the epic tale of Odysseus. The group sailed on private yachts; they found themselves in the midst of adventures with sirens and ancient kings (role-playing actors). Meals, like a goat barbecue on an uninhabited island, were reenactments from the Odyssey. Inspired by that assignment, and requests that followed, Nikolakaki recently launched a new travel company, Kudos Life Experiences. 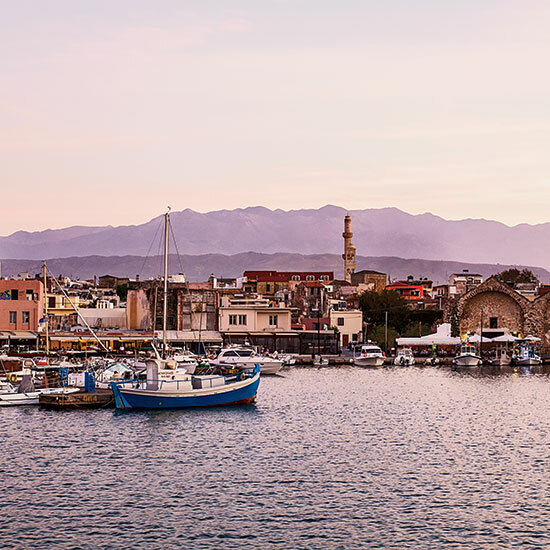 When I asked her to send me on a culinary adventure—minus the private yacht—she suggested Crete, one of Greece’s southernmost islands, and its biggest. Crete is the birthplace of Greek cuisine, known for everything from outstanding olive oil and lamb to tomatoes and sheep-milk cheese. The island is also home to standout artists, like ceramist Manousos Chalkiadakis, whose work is on display at his beautifully renovated 18th-century stone house near the White Mountains. “You can very easily spend a month on Crete and never get bored,” Nikolakaki promised. She made her point by designing a series of food-related adventures for me, based in or near Chaniá, Crete’s central port city. These activities included an Ottoman-period breakfast, under a lovely jasmine tree, and an excursion to the island’s most authentic and eccentric taverna, where I foraged for part of my lunch. kudoslifeexperiences.com. Kindeli recently began working with local food historian Mariana Kavroulaki to organize reenactments of ancient Greek meals and recipes. (Re-creating the culinary past is a growing trend worldwide, inspired in part by star chef Heston Blumenthal, who researches recipes at The British Library and serves them at his restaurant Dinner.) Kavroulaki, who has produced banquets for The Archaeological Museum of Delphi, prepared an Ottoman-inspired brunch for me. On a wooden table under a blooming jasmine tree, she set out bowls of a fresh quince, dried apricot and fig compote, based on a recipe from ancient Persia. Alongside, she served kaikanas, a dish of scrambled eggs with walnuts and goat cheese, and wheat bread from a recipe that goes back to the 16th century. “Crete has been a home for many cultures,” said Kavroulaki. “Tasting the island’s gastronomic past helps you understand its history.” metohi-kindelis.gr. Several hand-painted placards nailed onto crooked old olive trees (“wine tastings: follow the signs!” read one) led me past a small, modern winery to a whitewashed house fronted by a pergola of vines and a large stone terrace dotted with tables. Awaiting me was Alexandra Manousakis, a 30-year-old American whose father had been born in the house. Eight years ago, on a trip to Greece, she became entranced by the place and decided to stay and supervise the vineyards her father planted in the ’90s. With the help of Afshin Molavi, an opinionated sommelier who is now her fiancé, Manousakis has turned her father’s hobby into one of the most promising small-production organic vineyards in Greece. The couple sat me down to taste their eight wines, including the cultish, berry-flavored rosé. An excellent small taverna from the next village provided our lunch. The chef-owner, Evelina Makrinaki, served kalitsounia—traditional Cretan spinach pies stuffed with herbs and cheese in rustic, chewy pastry (below). “They’re the most delicious on the island,” Manousakis told me. As for the wines, “We’re experimenting with an old Cretan grape variety called Vidiano,” Molavi said. They’re planning to release that wine in the next year. Manousakis and Molavi are also a force in Chaniá’s emerging food scene. He owns a small wine bar, called Dagkli, right next to their house; more recently, he launched a third-wave coffeeshop, which transforms into a wine bar at night. Called Bespoke, the place focuses on small-production Greek wines and dishes like roasted beet salad with walnuts, and beef liver with Greek yogurt. Bespoke is always packed, but Molavi saved me a table when I went to check it out the next night. nostoswines.com. Introducing guests to talented locals is one of the things Kudos does exceptionally well. On my third day in Crete, Nikolakaki connected me with Dimitris Papageorgiou, a gregarious hiking guide. His job was to take me to meet the eccentric, much-buzzed-about chef Stelios Trilyrakis, who cooks in the style of his Cretan ancestors at his restaurant Ntounias. Papageorgiou drove me along a narrow, winding road, past the occasional wild goat and through a stone gorge covered by pine trees. We rounded a corner, and there it was: Ntounias, a one-story building with a porch taken up by big pots placed over an open fire. Inside, past a dozen small tables, you can glimpse the kitchen, where another stovetop is set over a fire alongside a wood oven. Trilyrakis is a frenetic but friendly character. Despite the lunch rush, he gave us a tour of the cellar, where he mills three types of flour for bread, pickles vegetables and stores wine made with grapes grown nearby. He pointed us down a path surrounded by olive trees and wildflowers: “My gardens and animals and beehives are down there.” As Papageorgiou and I explored, we picked wild horta (a spinach-like green) and wild thyme. On Crete, foraging isn’t a trend, it’s a way of life. Back in the restaurant, Trilyrakis laughed when we started looking over a menu. “I have a menu, but no one ever orders off of it,” he said. “I make what I like each day with the ingredients I have.” That day, he started us with a salad of tomatoes, onions and rusks (crunchy, crisp toasts) crumbled with mizithra, the soft Greek goat cheese. We also tried tomatoes stuffed with rice and the spicy horta we’d collected. Alongside, Trilyrakis offered apple chutney. “I normally serve the stuffed vegetables with yogurt, but it’s not the season to milk,” he said. “The shepherds allow their animals to get pregnant now, so we don’t make yogurt. Even yogurt has its own season.” ntounias.gr. Gisela Williams is the European correspondent for Food & Wine. She lives in Berlin with her family.